Coincheck – the Japanese digital currency exchanging platform has initiated to refund users and traders that were touched by the famous hack of $534 million worth of NEM in January 26, while simultaneously giving the opportunity of selling specific cryptos and withdrawals – based on the press releases that were set out on on the exchanges website. As mentioned above, withdrawals of Bitcoin, Ripple, Litecoin, Ethereum, Bitcoin Cash, Ethereum Classic have resumed while the sales of the token of the leading crypto Bitcoin did never stop. Almost a week ago [March 8], Coincheck did announce that they will initiate soon the compensation of costumers. The payment will be done in Japanese Yen at a value of 88.5 yen, approx $0.83, one Nem coin. Japan’s Financial Services Agency (FSA) has told seven cryptocurrency exchanges to improve internal controls, ordering two of them to cease business operations for a month. The country’s finance regulator said that it had issued two suspension orders to digital currency exchanges, Bitstation and FSHO. The five exchanges ordered to improve internal controls are Tech Bureau, GMO Coin, Mister Exchange, Bicrements, and Coincheck, reports the Financial Times. Yesterday, March 11 – we reported on how the co-founder of Ethereum Vitalik Buterin did introduce a scaling solution that could support exchanges to be more hack secured. It is called “Plasma Cash” and is an evolved version of the existing Plasma. 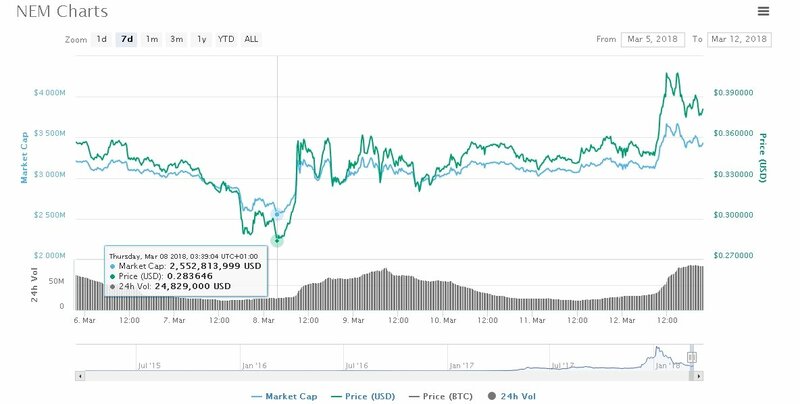 The news are clearly a positive factor impacting the community confidence and rise of price as the pair XEM/USD [NEM’s token] is the only one [out of the leading coins] that is on the green-gaining zone with over 8.63 percent increase in the last 24-hours reaching the mark of $0.3822 while leading the BTC market for 15.40 percent.